Are you frustrated trying to figure out what content your subscribers are most interested in? Do you see lower-than-average click through rates on your email newsletters? Perhaps it’s because your email is not segmented. In this case study, we’ll learn how Trading Strategy Guide used our content lock feature to add nearly 11,000 targeted subscribers to his list in a little over a month. Casey Stubbs of TradingStrategyGuides.com helps financial traders find a trading strategy that best fits their personality and goals. The site offers training through ebooks and video courses, as well as a private coaching program. 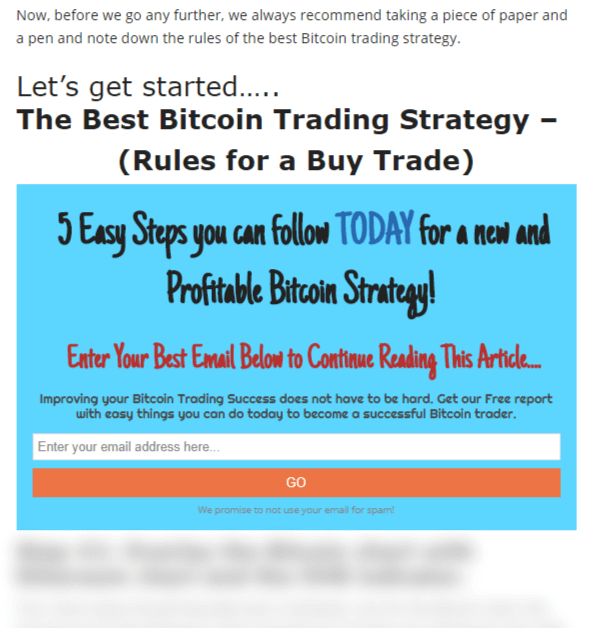 When their blog post about bitcoin trading strategies went viral, Casey took advantage of the increased traffic to explode their email list. As traffic increased to the bitcoin trading strategies post, Casey wondered what he could do to capture the email addresses of the added visitors. He knew that whatever he offered in exchange for the address had to be related to bitcoin, so that those visitors would be interested. He also knew he had to act quickly before traffic returned to normal. He didn’t have time to create an entirely new lead magnet to entice readers. Casey was already using OptinMonster on his site. He knew whatever optin he created, he’d be able to target to the bitcoin trading blog post using our simple page targeting display rules. Casey realized that people were desperate for the strategies shared in the bitcoin trading article. Rather than simply share the tips freely, he decided to learn how to use content locking to provide access only to readers who would provide their email address in exchange. A content locking script denies access to content until the reader completes a specific action, most often providing their email address. Once the reader subscribes, the content is immediately revealed. OptinMonster’s content locking script is available for inline optins which appear within the content of your page or post. Any content below the placement of the content locking script will be blurred out, or removed altogether, until the reader subscribes. In just under two months, Casey added almost 7,500 subscribers to his list from this single content locking script. Over 17% of visitors subscribe for access to the protected content. Once Casey saw success with this method, he began adding the content locking script on other pieces of content, too, adding an additional 3,200 subscribers to his list in the previous month. That’s almost 11,000 new subscribers added as a direct result of our content locking script! Casey is not the only OptinMonster customer to see huge gains using content locking. Whole Whale doubled their list and Photowebo increased their list by 3806% using content locking. Better segmentation of a large audience. Sites with large audiences often have unfocused lists. Offering content specific optins helps to segment your list by their interests and engagement. Instead of adding 7,500 subscribers who are generally interested in trading, Casey now has 7,500 subscribers he knows are interested in bitcoin trading specifically and can create followup campaigns just for these subscribers. Better list quality. The 7,500 subscribers who went out of their way to subscribe are more engaged and committed than the 35,000 other readers who viewed the article but didn’t want the strategies enough to share their email address. Micro-conversions like this help push a lead further into your sales funnel. Trading Strategy Guides took their most popular pieces of content and turned them into list-building machines using our content locking script. Trading Strategy Guides converted 17% of readers using targeted inline optins. Trading Strategy Guides added nearly 7,500 subscribers in just over one month using a single content locking script. 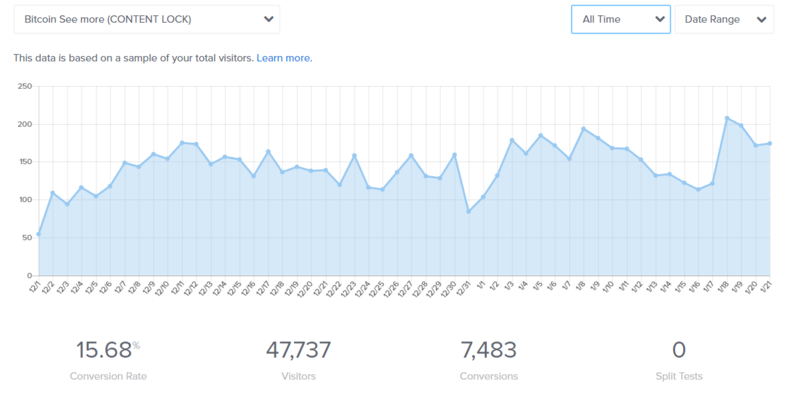 Trading Strategy Guides then added another 3,500 subscribers in the same time period implementing the same technique on other blog posts. Just because you share your best content at no cost doesn’t mean you have to give away for free. Implementing a content locking script gives you an opportunity to segment your list and increase the quality of your list at the same time, all without creating new content or lead magnets.